Every gardener’s goal should be to have diverse plantings in their garden. This means growing a variety of vegetables, fruits and flowers. While we all reap rewards from our edible crops, flowers are an equally important component. In addition to attracting pollinators, hummingbirds and butterflies, they delight us with their beautiful colors and shapes. There are plenty of annual flowers worth adding to our gardens. I’ve highlighted below some of the easiest to grow; they can be sown directly into the garden once the danger of frost has passed. While most prefer a sunny location, nasturtiums will tolerate light shade. In my opinion, no garden is complete without a perky array of sunflowers. If you want to enter tall ones into the fair, try Sunzilla, Titan or Mammoth Grey Stripe. Looking for luscious fall colors? Autumn Beauty, Red Sun or Royal Flush are for you. For more petite sunflowers to use as cut flowers, think about Moonshadow, Jade and Peach Passion. No matter which ones you grow, they’ll attract plenty of bees and the birds will love the seeds in the fall. Nasturtiums are doubly wonderful for adding bright splashes of color and producing spicy, edible flowers. Why not add some to your vegetable garden? Climbing cultivars – which require some type of support – include Amazon Jewel, Spitfire, Moonlight and the climbing version of Phoenix. You might be surprised to learn that both Amazon Jewel and the dwarf Alaska have variegated leaves that will add interest to your beds. For a stunning combination, try Mahogany and creamy Peach Melba, which are both more compact. I’ve had a love affair with zinnias for decades. The plants attract pollinators and produce an abundance of brightly colored blossoms that make long-lasting cut flowers. For hot colors, you can’t beat Mighty Lion, Oklahoma Scarlet, Hot Crayon Colors, Benary’s Giant Orange or the more petite Persian Carpet mix. For something more subtle, try Queen Red Lime or Green Envy. The lacy foliage and intriguing blossoms of love-in-a-mist (Nigella) make this annual a must for any garden. For a long time, there weren’t many color choices but now there are plenty of options. Two cultivars that have caught my attention are Bridal Veil (white flowers with deep purple centers) and Delft Blue (white with blue splashes). 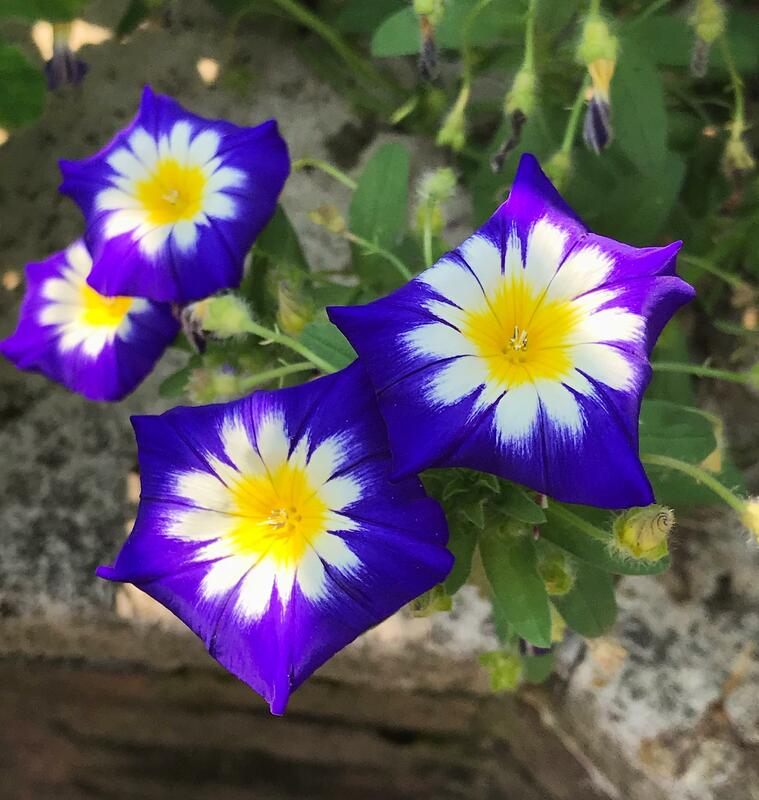 One annual that is definitely going into my garden this year is a dwarf morning glory called Royal Blue Ensign. While visiting the Chicago Botanic Garden last summer, I saw containers of it that took my breath away. The blossoms feature cobalt-blue petals, yellow throats and splashes of white. The plants will grow 12 to 18 inches tall. Cosmos is another lovely annual featuring delicate blossoms that gently sway in a breeze. Our choices used to be limited to the pastels of Sensation mix or the colorful orange-and-yellow Bright Lights. While those standards are still available, I’ve got my eye on the new pastel Cupcakes with their unusual pleated petals. Other new offerings include Double Click Cranberries, Double Click Snow Puff, pale yellow Lemonade, and Double Take with soft pink petals edged in magenta. Today’s plant breeders sure know how to complicate our seed-buying decisions. One last thing: if you truly love the birds that visit your garden, remember to leave the plants with their spent flowers in place this fall so they can nibble on the seeds all winter long. And if they miss a seed or two, you’ll be rewarded with more lovely flowers next year.